Located in southwest Louisiana, Lafayette is the capital of Cajun country. The city was originally founded in 1821 by a French-speaking Acadian named Jean Mouton. He called the town Vermilionville. In 1884, the city was renamed in honor of the Marquis de Lafayette, who had assisted the United States in the Revolutionary War. Those Jews who left their families and homes in Europe in the 19th century and ventured to a foreign land with no knowledge of the local language must have been adventurous and ambitious. Of course, some fled persecution in Europe, while others were drawn to America’s economic opportunities. When they could, immigrants tried to settle in places relatively similar to their locales in Europe, seeking a bit of familiarity in a strange new world. This helps explain why so many Jews from Alsace-Lorraine settled in Vermilionville: they felt comfortable with the language and the quasi-French Cajun culture. Lafayette’s history has been inextricably bound with its Jewish population. Although they have always been a very small percentage of the local population, Jews were never on the periphery in Lafayette. Without several influential Jewish businessmen, Lafayette’s development would certainly have been different. ​One of the most influential Jews in Lafayette’s history was Maurice Heymann. Heymann was born in New Orleans in 1885. His father was a Polish Jew named Henry Heymann (born Leon Kopcwiski) and his mother was a French Jew named Caroline Rosenthal. The Cajun capital was a perfect fit for Heymann because of his mother’s French background. Though he only received a sixth grade education, Heymann learned to peddle wares from his father and even as a child worked as a butcher boy, selling meat on the old Ponchartrain Railroad. Within a few years, Heymann was embarking on his own capitalist ventures. Recognizing a potential market among the local Native American community, Heymann was able to peddle his wares successfully enough to purchase his first store in Lafayette in 1916. Heymann displayed a keen business acumen. To try to fool people into thinking that his small business owned two different delivery trucks, Heymann painted one side of his truck “Go-Getter #1” and the other side “Go-Getter #2.” With “Watch Us Grow” as his motto, Heymann’s business thrived. Before long, Heymann had established himself as one of the premier businessmen in town. His success and philanthropy were unprecedented, and he was particularly generous toward the sick and the orphaned of Louisiana. In 1937 he opened a “food center” in his Lafayette department store, which became the city’s first supermarket. Heymann’s most lasting impact on Lafayette was his development of the Heymann Oil Center in 1952. The “Hub City” was close to the gulf and was large enough for conducting business, so oil companies flocked to Lafayette. They bought offices on the real estate owned by Maurice Heymann. Such a lucrative transaction meant enormous wealth for Heymann, who reportedly was one of the first citizens of Lafayette to have an air-conditioned home. Not only did Heymann amass a fortune, but he also made significant contributions to the community. He sold the land near the oil center for a medical center to be built, thus transforming downtown Lafayette into a mile-long “Miracle Strip.” Heymann was the winner of Lafayette’s first Civic Cup Award for his community involvement. In the words of his son, Maurice Heymann was the entrepreneur who transformed the sleepy agrarian town of Lafayette into the dynamic oil center of South Louisiana. Henri Bendel was a Jewish native of Lafayette who became internationally renowned for his haute couture design. Henri Willis Bendel was born in Vermillionville in 1868 to Mary Plonsky Bendel and William Louis Bendel, a former British Navy officer who died young in 1874. As a young man, Bendel opened his own millinery shop in Morgan City, where he built a relationship with the Lehman family. That relationship was even further solidified when he married the boss’ daughter, Blanche Lehman. The young couple moved to New York City, and Bendel gained a reputation for his design talents. As his business began to take off, and after only two years of marriage, Blanche died. To cope, Henry plunged into his work, soon opening large stores on Fifth Avenue and Paris. His designs were instant hits and his business skyrocketed. Despite his success, he never forgot his family in Lafayette, making occasional trips back home. Bendel died in 1936. Henri Bendel’s business savvy may have been genetic. His mother was Mary Plonsky Bendel, an astute, German-born businesswoman in Lafayette who operated a large furniture store, a dry goods store, a drug store and an undertaking parlor. His stepfather, Benjamin Falk (who had married Mary in 1878), was a Russian-born dry goods merchant and one of the most successful businessman in late 19th century Lafayette. Falk was very involved in local civic affairs, serving as assistant fire chief, city alderman, and director of the Lafayette oil mill, in addition to his participation as a Mason and a Knight of Honor. When, at the turn of the century, the city lacked the funds for full-time fire fighters, Falk and 25 others volunteered as firemen, naming themselves the “Hobo Volunteer Fire Company.” Falk also owned the city’s entertainment center, Falk’s Opera House. He played a significant role in establishing the Lafayette Improvement Association, the forerunner to today’s Chamber of Commerce, and helped establish a high school in Lafayette, which opened in 1894. When Falk died unexpectedly in 1901, the Lafayette Daily Advertiser called him “one of the leading and most prominent men” of the city. The newspaper praised his kindness and generosity; his funeral, appropriately, was “the largest ever seen in Lafayette.” As there was no rabbi in the city, Rabbi Leucht of New Orleans conducted the funeral services. Another important early businessman in Lafayette was Lazarus Levy, who moved to Vermilionville in 1878 with his wife Frimitz (Frances) Plonsky. An ex-Confederate soldier, this Russian-born Jew became a very successful dry goods merchant by establishing his central store across from the Bendel stores. 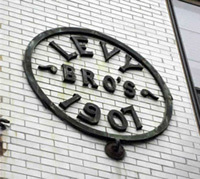 Three of his sons, Victor, William and Mose, also became merchants, opening the Levy Bros. store in 1907. With their clever motto, “We don’t go East for nothing,” intended to boost confidence in the quality of their wares, the brothers succeeded in downtown Lafayette. When the very first Jews arrived in Vermilionville is unknown, though most estimate that it was the early-to-mid-19th century. The development of the Jewish community followed the usual pattern of Southern Jewish life: first build a cemetery, and then construct a synagogue. In 1869, former Louisiana Governor Alexander Mouton gave the Jews of Lafayette a tract of land for a cemetery that was informally called “Hebrew Rest.” In April 1890, the cemetery, now formally named “Menachim Aveilim” (“Comforting the Mourning), was chartered. A meeting to organize a graveyard society was held in Falk’s Opera House. In attendance were Benjamin Falk, Solomon Wise, Joseph Wise, a Polish store owner, Gustave Godchaux, a French-born lumber dealer, Jacob Isaacs, a German merchant, Joseph Plonsky, a Prussian-born dry goods merchant, G. Schumuler, J. Bendel, and Abraham Haas. The founding members envisioned the cemetery as a final resting place for the Jews of Lafayette and its surrounding environs. In their own words, the importance of a Jewish cemetery “has been a characteristic which has distinguished him [the Jew] in all ages and under all conditions.” Their dream was soon realized. 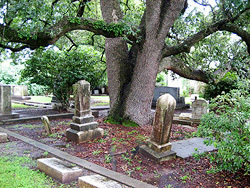 Today oak trees still provide shade for the beautiful and well-kept cemetery, which houses the souls of Lafayette’s departed. A cemetery was not enough for the survival of Jewish life in Lafayette; the community needed a place to worship. Early on, Jewish people in Lafayette congregated in private homes for services, but the community soon outgrew such quarters. On June 4, 1881, Hyman Lieberman, Joseph Plonsky, Lazarus Levy, Benjamin Falk, Eugene Levy, and others organized the Hebrew Association “Rodeph Sholom” (“Pursuit of Peace”) with the intention of forming a proper congregation. After being approached by members of the community for a place to build a synagogue, ex-Governor Mouton donated a plot of land to the group for a synagogue. The President of the Hebrew Association in 1881, Hyman Lieberman, accepted the land on behalf of Rodeph Sholom. The charter members of the new temple were Lafayette’s most prominent Jewish citizens: Leon Plonsky, Lazarus Levy, Benjamin Falk, Solomon Wise, Joseph Wise, Abraham Haas, Hyman Lieberman, and M. Kahn. Once they had the land, the community needed the proper funds to build the edifice. The members of Rodeph Sholom began soliciting contributions from the Lafayette population. Bazaars were held to raise money, and all day picnics were convened to bring in donations. In January 1882, the synagogue issued a call for contractors in Lafayette to build the new temple, under the direction of Lieberman. Seven years later, in 1889, the synagogue was built. When it was completed, the local newspaper declared it a “tremendous building” for the local Israelite population. Due to the generosity of the congregation, it also served as a temporary home for a local church; between 1902 and 1910, Lafayette’s Baptists held their weekly Sunday services in the synagogue. Rodeph Sholom was founded as an Orthodox congregation, but soon adopted Reform Judaism. In its early years, the congregation did not have a full-time rabbi, relying instead on rabbinical students from Hebrew Union College. For example, according to the Lafayette Daily Advertiser, from 1902-1905, Abraham Cronbach, a student at HUC, conducted services on Rosh Hashanah and Yom Kippur. During WWII, a rabbi was employed to conduct services twice a month in Lafayette (and once a month in Crowley and Opelousas). But there were permanent rabbis in Lafayette as well as itinerant clergy. A number of rabbis have served Lafayette over the years, including Rabbi Sternberg, Rabbi Block, Rabbi Isidore Rosenthal, Rabbi Samuel Volkman, Rabbi Gutman, Rabbi Sternheim, Rabbi Topel and Rabbi Henry Sandman. In 1913, the Lafayette Sisterhood, originally named the Jewish Ladies Aid Society, was organized under the leadership of Mrs. Abram Simon. The women of Rodeph Sholom served the community in many ways. Throughout the 20th century, the Sisterhood was influential in fundraising for the community through euchre nights and dance events, and in raising money for charity, including the Jewish Braille Review, the Defense Council, and cancer research. During World War I, they were active in the Red Cross and entertained soldiers in Louisiana. In 1933, they became responsible for the synagogue’s Sunday School. 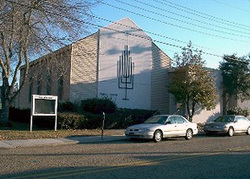 The Sisterhood was instrumental in educating the Jewish children of Lafayette, sponsoring the temple choir, maintaining the building grounds, and reaching out to the greater Lafayette community. 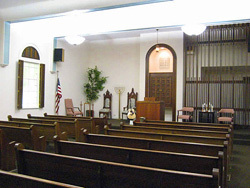 Rodeph Sholom’s synagogue was remodeled several times in the 20th century, in 1932, 1953, and 1974. Due to the construction of the Heymann Oil Center in the 1950s, Lafayette’s Jewish community expanded significantly. In 1960, there were about 105 Jews in Lafayette; by 1980, there were an estimated 600 Jews in the area. Rodeph Sholom, in turn, grew in numbers and a social hall and kitchen were built in the synagogue. This growth brought many Jews from more traditional backgrounds to Lafayette who were not satisfied with the classical Reform style of Rodeph Shalom. In December of 1973, a group of Rodeph Sholom’s congregants split away, forming a new congregation called Yeshurun Synagogue. Originally, the group, consisting of thirteen families, met in members’ homes. They soon established a religious school. For Rosh Hashanah and Yom Kippur, they hired Rabbi Mark Cartun to lead services in a private meeting room. Two members donated a Torah for the new congregation to use. By 1975, this new, more conservative institution had its own building along Kaliste Saloom Road as well as a newly organized Sisterhood. Although they had split away from the classically Reform Rodeph Shalom, Temple Yeshurun decided to affiliate with the Reform movement as well, and began to hire student rabbis from Hebrew Union College. The reason for the split was a mix of conflicting ideologies and clashing personalities—but the heart of the debate was always pure: what is best for the future of Jewish life in Lafayette? Both remained relatively small synagogues, with Yeshurun claiming about 25 families within its first decade, but no full-time rabbi. 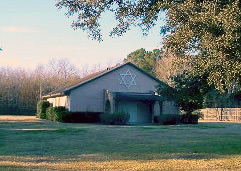 Most of Yeshurun’s members were younger, and for a time the upstart congregation had the only Jewish religious school in Lafayette. Lafayette has been a haven for its Jewish residents. They have been involved in the oil business, retail trade, medicine, and the local state university. Although the temple still serves members from Opelousas and Crowley, there are significantly fewer Jewish citizens in those cities today. Lafayette has also seen a sharp decline in its Jewish population. By the mid-1990s, only about 250 Jews still lived in south central Louisiana. Today, that number is most likely smaller, although a handful of Jews from New Orleans settled in Lafayette after Hurricane Katrina. The synagogue in Lafayette has always faced certain challenges: Were its stained-glass windows too Christian? Should a non-Jewish choir be employed? Should services be conducted in Hebrew? How are Jews fitting in with the local, predominantly Catholic, population? As the “assimilation pendulum” swings, as former Temple Shalom president Fay Bowen put it, the community does its best to compromise and survive. As one of the oldest active synagogues in Louisiana, it looks back to its illustrious history for guidance and tradition.